The Oregon Timber Trail aptly starts in the middle of nowhere on the California border. You’ll leave Oregon’s highest town and traverse the 140 mile Fremont National Recreation Trail. You’ll be rewarded with the stunning views from Winter Rim, a feast at the legendary Cowboy Dinner Tree, and have the opportunity to stay at a number of primitive fire lookouts. The Fremont Tier is one of the most challenging Tiers but also one of the most rewarding. Services are few and far between but the landscapes you’ll pass through are unparalleled in the state. 14,300 years ago, much of the low basin range country and alkali lakes were part of a giant inland sea teeming with wildlife. North America’s first settlers lived on the shores of this vast body of water, living off the cornucopia of aquatic life. Today the sea has dried up and its floor dried out. The mountains are buried in snow each winter, feeding the gurgling small rivers and streams that meander out into what is now ranch land. You’ll crest the highest point of the whole route at 8,200 feet shortly after starting and continue along ridge lines of ponderosas, rock and dry grassland. Nearby peaks offer rentable fire lookouts like Drake Peak, Currier Guard Station, Bald Butte, Fremont Point and Hager Mountain. 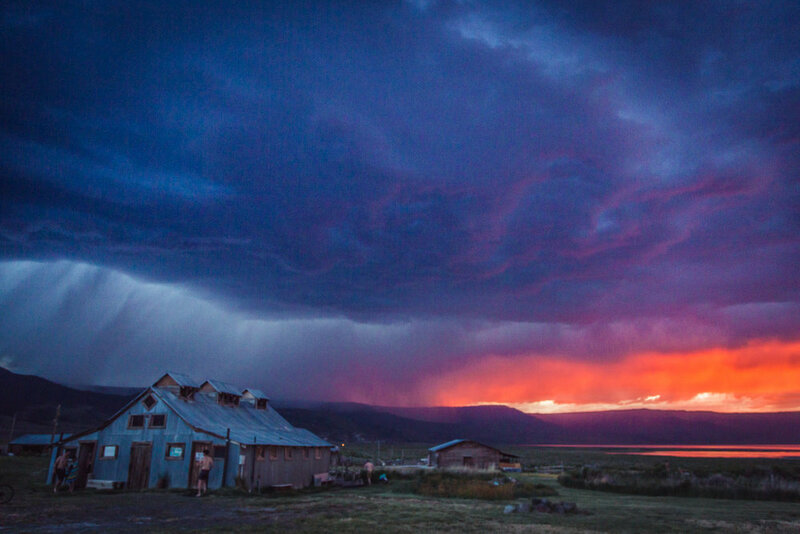 The valleys are punctuated by trout streams, bird life, and even some relaxing hot springs. Getting to the southern terminus can be somewhat of a hurdle (see the “Getting There” section at the beginning of this guide). The Fremont Tier is certainly the most remote of the whole Timber Trail. Trails may difficult to navigate—or even find— and daily mileage may be slower than anticipated. This, combined with the minimal resupply points, means riders should be extra judicious when meal and water planning. The first 90 miles are remote and without services. There will be only two obvious bail points. There are several long (~50 mile) sections without water, and the existing water sources are small intermittent springs. The quality and reliability of these are unknown. Check OregonTimberTrail.org for more current updates throughout the season. Severely debilitating mud can be a factor with these eastern Oregon soils, beware of rain in the forecast. The only supply points are in Lakeview, Paisley (7 miles off route at mile 91), Silver Lake (9 miles off route at mile 148), and Chemult (Mile 206). The Oregon Timber Trail and the Fremont Tier begin high up in the Warner Mountains quite near the tristate corner of California, Nevada and Oregon. You’ll crest 8,300 feet in the first 15 miles—the highest point on the whole route as you work your way north along exposed, rocky ridge lines. Mount Shasta will be viewable in the distance across vast plains and valleys to the south, and the snowy tips of the Three Sisters to the north will start poking from the horizon. 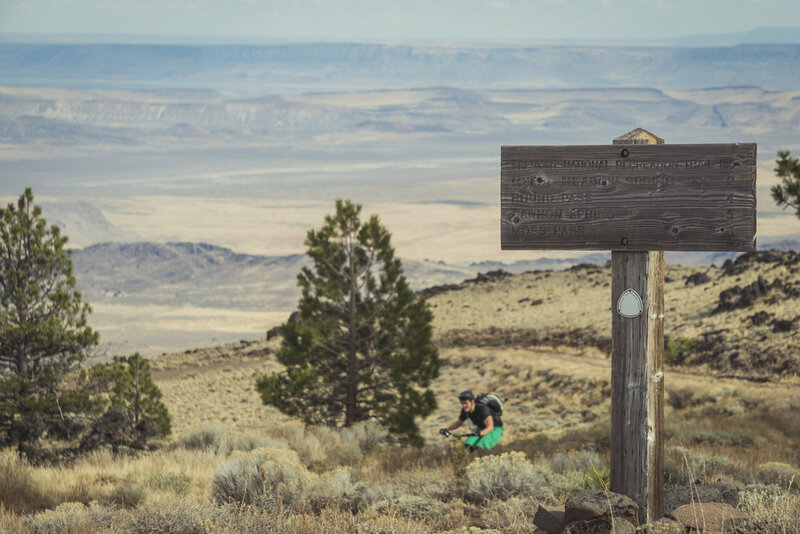 The Basin and Range segment deals a healthy dose of ups and downs giving riders an appreciation for the geologic forces that shaped this landscape. It also lends a glimpse into Oregon’s rich ranching history and how settlers and modern farmers manifest their livelihood. The forest here is dry, high elevation and sparse. Be on the lookout for migrating birds, deer and pronghorn antelope. Groves of quaking aspen line seasonal streams and ring freshwater springs. Ponderosa stands grace the flanks of ridge lines and deposit thick needle beds on the forest floor. Leaving the southern tip at Cave Lake the route climbs for about three miles on forest roads before turning into faint trail rolling up and down over Crane Mountain. The first reliable water source, Camas Creek, lies at mile 27 but if you detour to the east off of Crane Mountain at mile 12 on NF4011, Willow Creek Campground is a nice primitive campground with vault toilets and a mountain stream. Rejoin the route by following NF3915 to Rogger Meadows. At mile 26, just before crossing the Warner Highway there’s the rustic Squirrelville Lodge, available to rent. After crossing Warner Highway and a short climb you can choose to stay on the ridge route or detour towards Bull Prairie and Drake Peak. A few miles off the route on NF3615 you’ll find Mud Spring Campground with potable water and toilets. Nearby is the rentable Aspen Cabin; or the really adventurous can climb to Drake Peak Lookout (rent in advance). From here, follow Crooked Creek for a stunning 7 mile descent back to relative civilization on Highway 395. Don’t forget to fill up on water at the Crooked Creek Mill Trailhead, the next reliable water is 25-miles away. 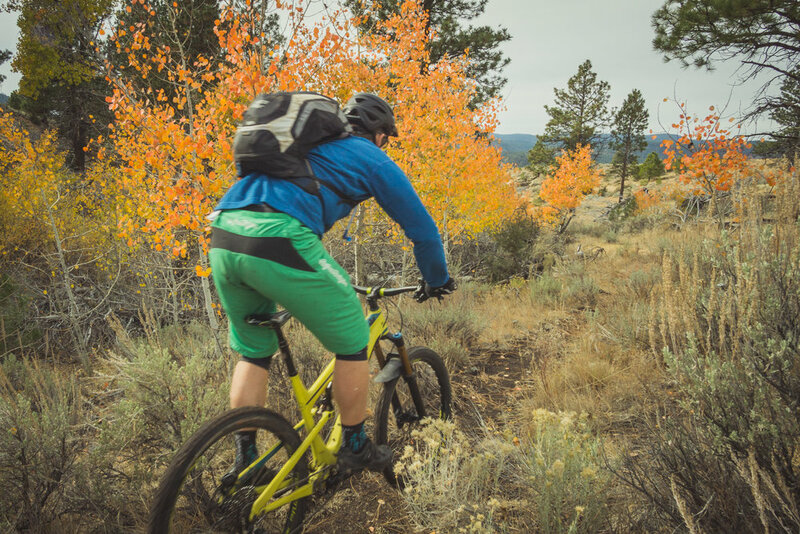 Ride south for about 3 miles on Highway 395, and then turn north once again and climb to reach Cox Pass Trailhead, Moss Pass, Round Mountain and the spectacular ridge line to Morgan Butte. 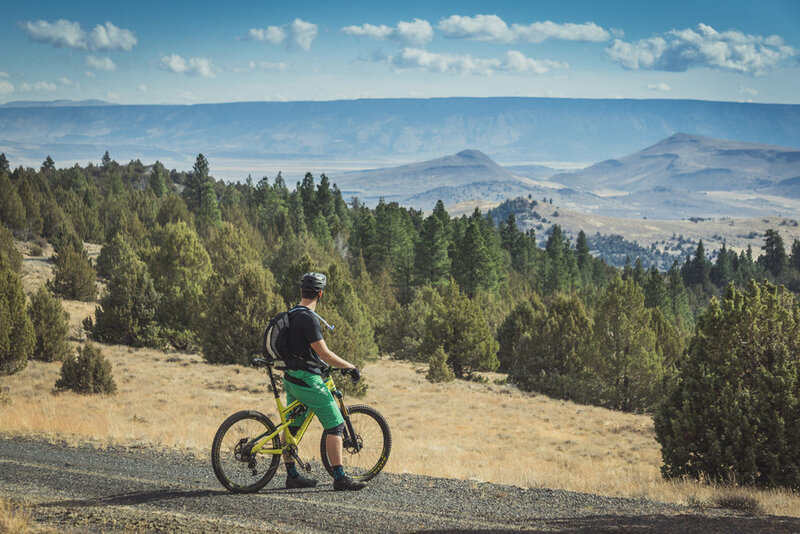 A final 10 mile scenic descent off Morgan Butte drops you at the Chewaucan River and the end of the Basin and Range segment. A short, flat 7-miles away lies the first resupply on the route: Paisley. A lively tavern, diner, coffee stand and small grocery store offer up good conversation and warm meals. The city hosts a Mosquito Festival on the last weekend of July, so plan your trip accordingly! But Fremont’s discovery of the area is quite tardy when put in context—the oldest DNA evidence of human habitation in North America was found in that same Summer Lake Basin where early generations of the first Americans camped in caves on the shores of a giant inland sea some 14,300 years ago. Distinct north-south topographic features such as Winter Rim serve as important routes for migrating birds. And indeed, with the Klamath basin, Sycan Marsh, and Malheur Marshes to the west and east Winter Rim lies smack dab in the midst of a migrant bird mecca. Keep your eyes on the sky looking for waterfowl, golden eagles, hawks and even owls and accipiters in the open pine forests. The Fremont National Recreation Trail follows a scenic path along the rim and through the forest. It’s only 62 miles, but it’s a rugged segment, expect to detour and wayfind frequently along Winter Rim. As you leave the Chewaucan River and begin the Winter Rim segment water sources will become quite scarce as you crest the rim and no food resupply will be available until Silver Lake. Beginning this segment the trail juts up steeply at first, then gradually gains 2,500 feet over 10 miles as you climb to Government Harvey Pass and Winter Rim along the Bear Creek drainage. A very important water resupply is at Currier Spring (Mile 104) with a slight detour to the west. Currier Spring is the only reliable water source on the Winter Rim segment, a distance of 62 miles between the Chewaucan River and Silver Lake. The next twelve miles may be some of the most scenic on the whole route. The Fremont National Recreation Trail follows the rim to Fremont Point and beyond, but is difficult and ponderous to follow. Most of the downed trees have been cut out by Oregon Timber Trail Alliance stewardship crews, but the trail can be overgrown in sections and wayfinding done by following large cairns. The trail consists of large chunky babyheads, making forward progress slower than expected. This entire area is in a period of wildfire rejuvenation, tread lightly and be aware of the new, sensitive growth reestablishing itself after the fire. Fremont Point hosts a reservable cabin, toilet, and small picnic area. And, of course, views of a huge swath of southeastern Oregon. 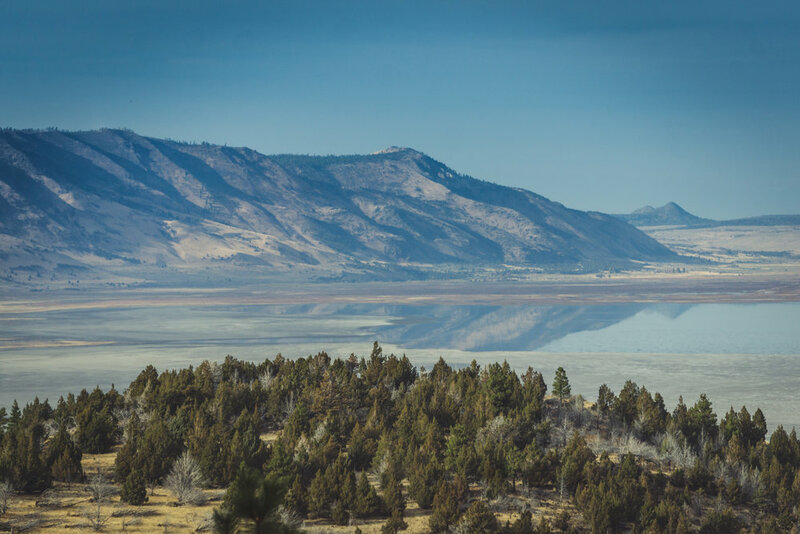 After another eight miles of meandering along the rim, the Fremont National Recreation Trail veers westward away from Summer Lake and gradually descends to Farm Wells Campground, eleven miles away. Before segment two is finished, you climb again, up the flank of scenic Hager Mountain and down to NF28. You can detour up to the peak of Hager Mountain (7,200 feet) at mile 146 for some spectacular 360º views and a reservable fire lookout. 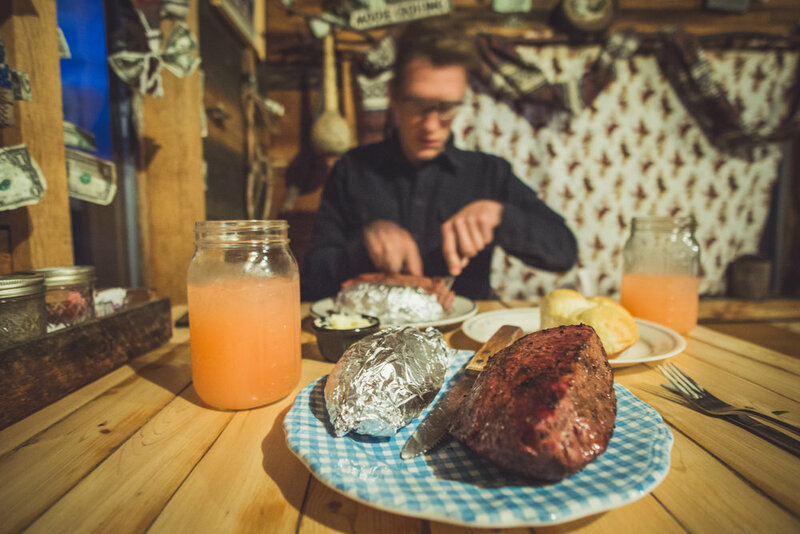 Once you hit NF28 Silver Lake’s small store is a fast nine miles (paved) away, but don’t forget to make reservations at Cowboy Dinner Tree outside of town—their 30oz steak dinners are legendary. The Mazama Blowout segment begins with a long climb to the summit of Yamsay Mountain and then descends through the fallout zone of the Crater Lake eruption. The most distinct change in landscape you’ll notice here is the prevalent red rock lining the roads and forest floor. These millions of acres of pumice scattered through the forest used to lay deep under the earth where Crater Lake now sits. About 7,700 years ago Mount Mazama blew up and the resulting debris field buried a huge swath of central Oregon. Today it’s covered in giant ponderosas and a network of quiet red roads. This segment serves as an important connector between the Fremont Tier and the Willamette Tier—basin and range country to the famous old growth firs of Oregon. The forest is open and sparse, providing many good dispersed camping options. Once leaving the summit of Yamsay Mt, Jackson Creek (Mile 179) and Lost Creek Spring (Mile 199) are your only water sources. In Chemult, you can rent a hotel room, eat some hot food, or grab some cold beverages and relax at Walt Haring Campground less than a mile out of town.